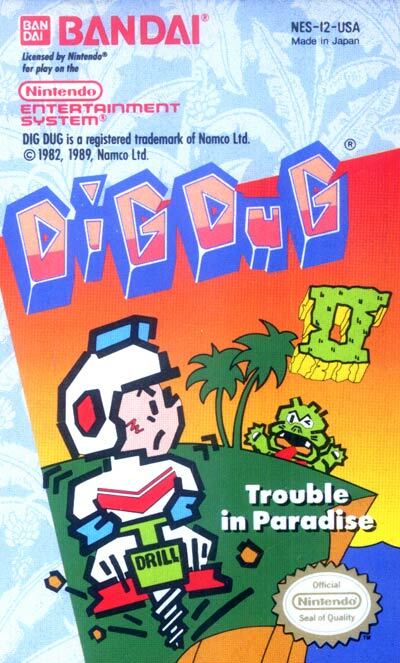 Unlike the first game, Dig Dug II takes place on an island with an overhead view. The goal is simple: to kill all the enemies on the level. There are two types: Pookas, the round red monsters with goggles, can only touch Dig Dug to kill him, but Fygars, the dragons, can breathe fire to burn Dig Dug. In this game, Dig Dug is armed with two weapons. One is a pump from the original Dig Dug, and the player could pump up enemies until they popped in the same manner. The other is a jackhammer. There are a few dark spots on the terrain, and the player can drill into them and create creases in the land. If a piece of the terrain is cut off completely, it will sink into the ocean, and any enemies (and possibly Dig Dug) will go down with it. The points earned from this depend on how many enemies are killed at once. After level 31, the levels have the same layout as the one 16 levels before it.